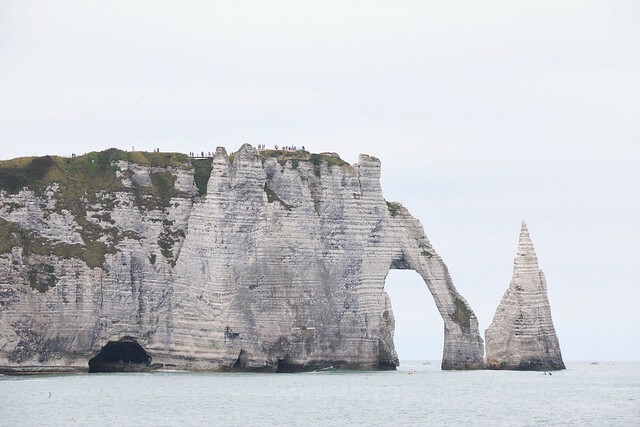 Though my husband and I generally avoid travelling during the summer months, all of our off-season travel plans have been forcibly put on standby until I wrap up my academic venture and internship. We have, nonetheless, managed to squeeze in the occasional long weekend getaway. 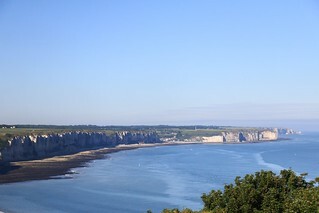 Our latest excursion was a road trip to the coast of Normandy in northwestern France. 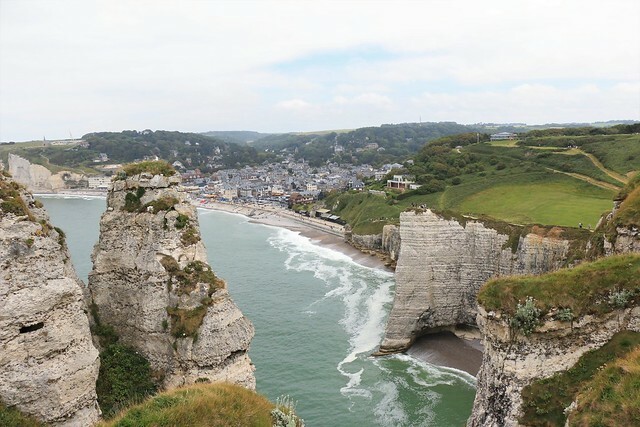 While only a couple of hours away from Paris, the rolling countryside of Normandy transports you to a whole other world, where cows leisurely roam the pastures and apple orchards adorn the landscape. Any worries and notions of responsibility quickly evaporate the minute you enter this bucolic region. 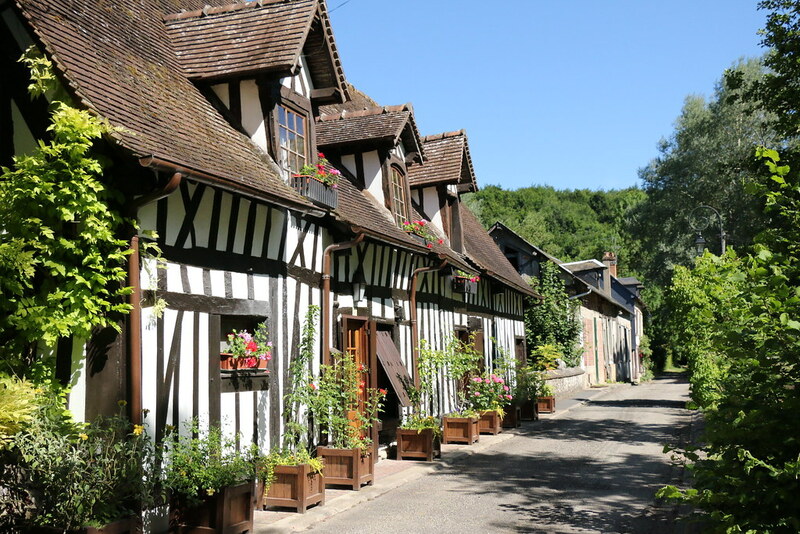 Our first stop on the trip was Lyons-la-Forêt, a tiny village of less than 1000 inhabitants that is about 20 miles from Rouen and figures on the list of France’s most beautiful villages. 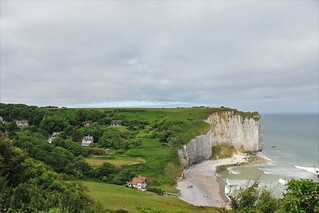 After exploring the charming village on foot for a couple of hours, we continued on to the Côte d’Albâtre (Alabaster Coast), where the chalk cliffs mirror those of England’s Jurassic Coast. 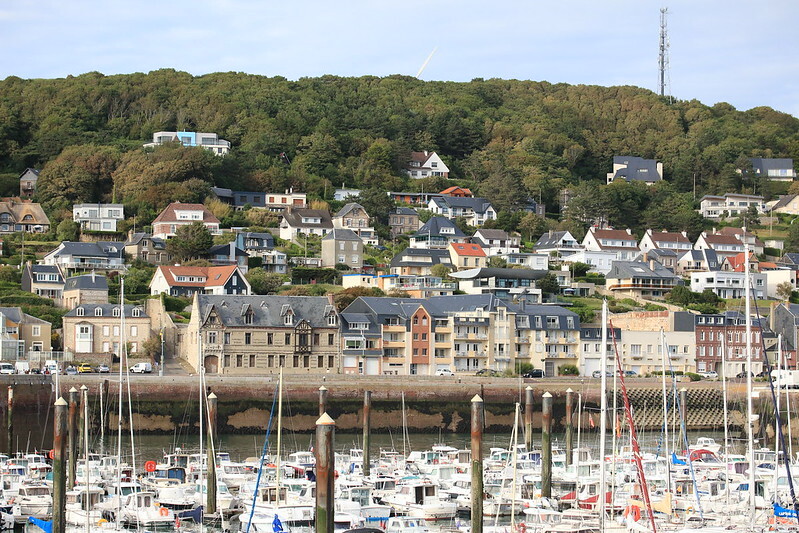 We started on the westernmost corner of the coast at the port city Le Havre, where Julia Child and her husband Paul entered France by boat when they moved to Paris in 1948. 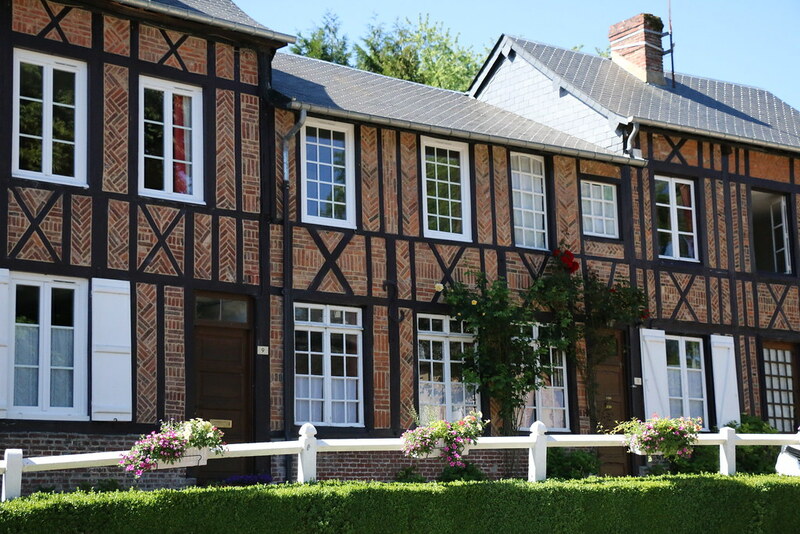 Having suffered heavy damage from WWII, much of the ravaged city was rebuilt. 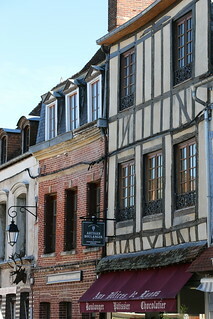 Consequently, the architecture lacks traces of the city’s past and few, if any, buildings exhibit the characteristic half-timbering commonly seen in Normandy. 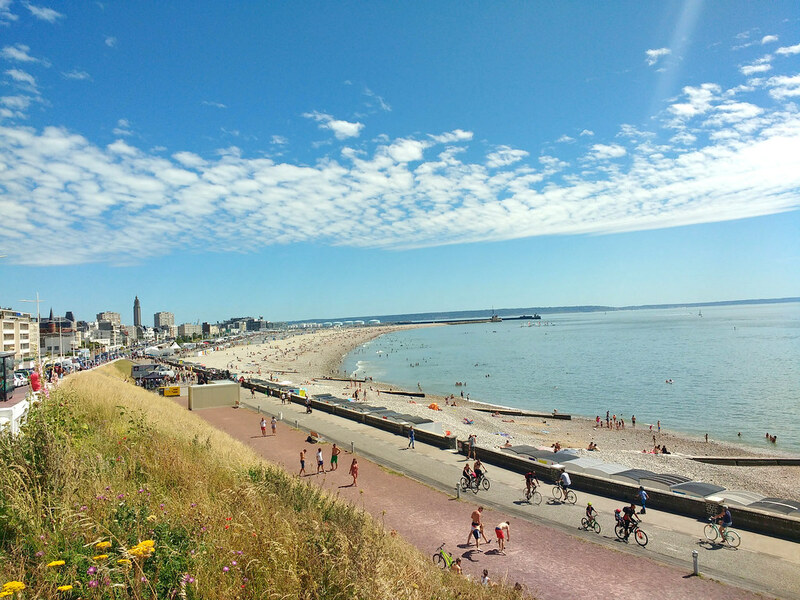 After a quick tour of Le Havre, we spent the rest of the weekend visiting the coastal villages as we made our way towards Le Tréport, the port city that bookends the easternmost point of the coast. We took this trip just before the vacation season started, so we had the roads to ourselves and unobstructed views of the extraordinary landscape. 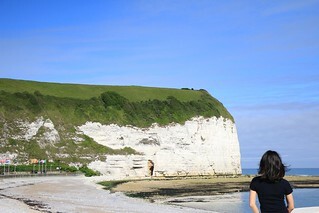 At times, we were the only folks on the beach, which was a welcome contrast to Paris’s overly dense streets. 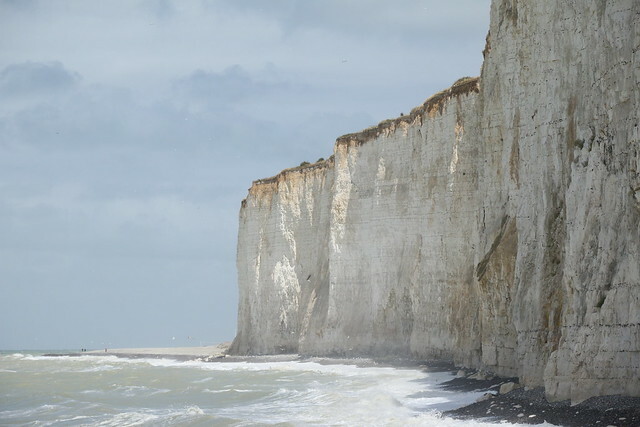 Hopping from village to village, we were continually in awe of the immense chalk cliffs, which often reminded me of the stunning backdrop of Broadchurch. 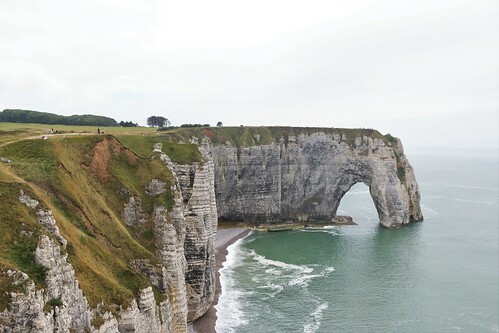 Though brief, spending just a few days breathing the fresh ocean air, soaking in the spectacular coastal views, and hearing the waves crash into the cliffs was enough to recharge my batteries until our next getaway. I came back reinvigorated and eagor to be in the kitchen cooking again despite the suffocating heatwave that welcomed us on our return to Paris. One of the dishes that I spontaneously came up with recently is a vermicelli noodle bowl topped with tofu. Before lightly frying the tofu, I dusted the surface with turmeric and coated them with minced lemongrass and chili peppers. 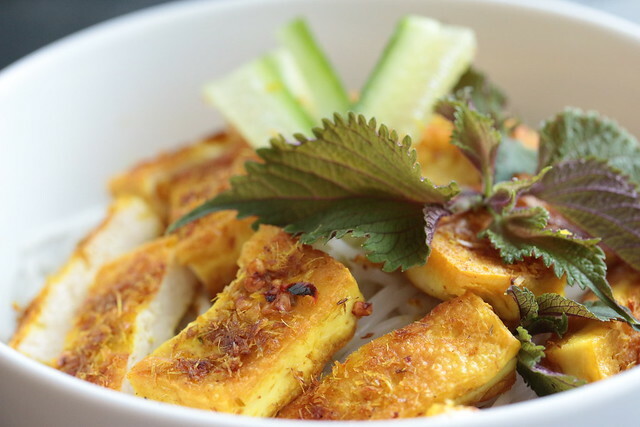 The fried tofu and vermicelli rice noodles sit on a bed of chopped lettuce and fresh aromatic herbs. 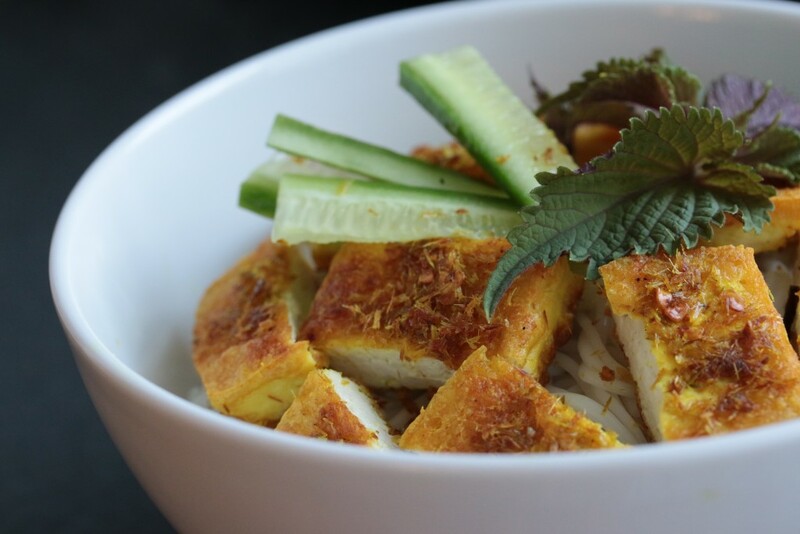 Before serving, the noodle bowl is dressed with a drizzle of a nuoc mam mix. 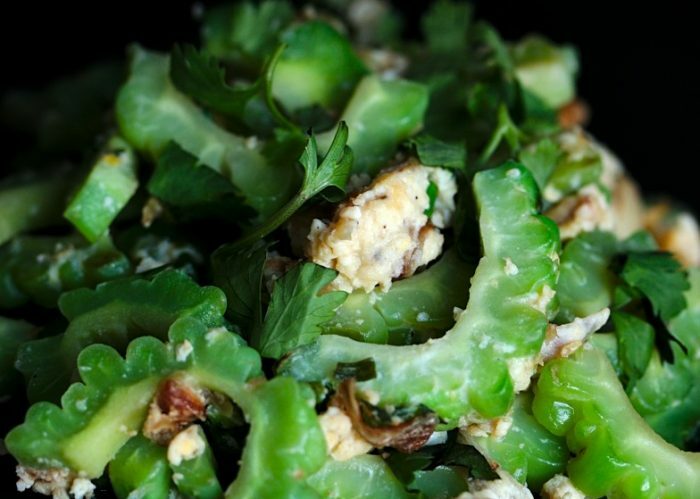 This is an ideal summer dish that minimizes stove and prep time, yet doesn’t skimp on flavor. 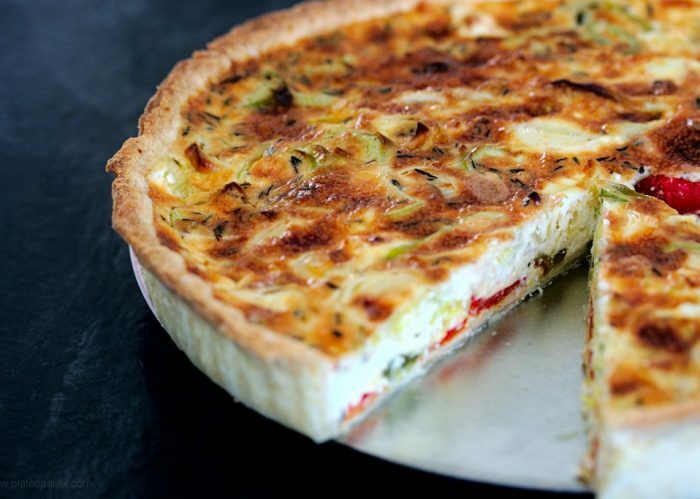 What sort of dishes do you cook to stay cool in the summer heat? Cook the rice noodles in a pot of salted boiling water. Allow to cook for about 7-9 minutes, while stirring gently with chopsticks. The noodles will become opaque as they cook. I usually verify that the noodles are cooked by tasting a strand. It should be a little softer than al dente, but not soggy. Once the noodles are cooked, drain them in a colander and rinse with cold water. Give the colander a few shakes to drain any excess water and set aside. 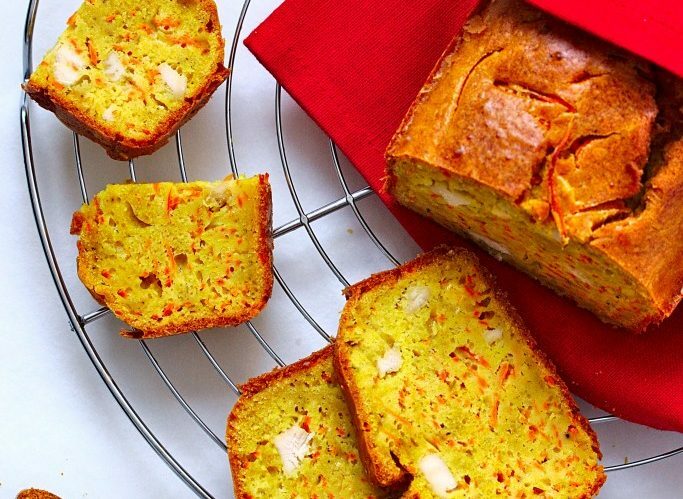 Pat the tofu dry with paper towels. Then, cut them into 6×3 cm rectangle slabs, about 1.5 cm thick. Mix the salt and tumeric in a small bowl and sprinkle evenly on the surface of the tofu slabs. 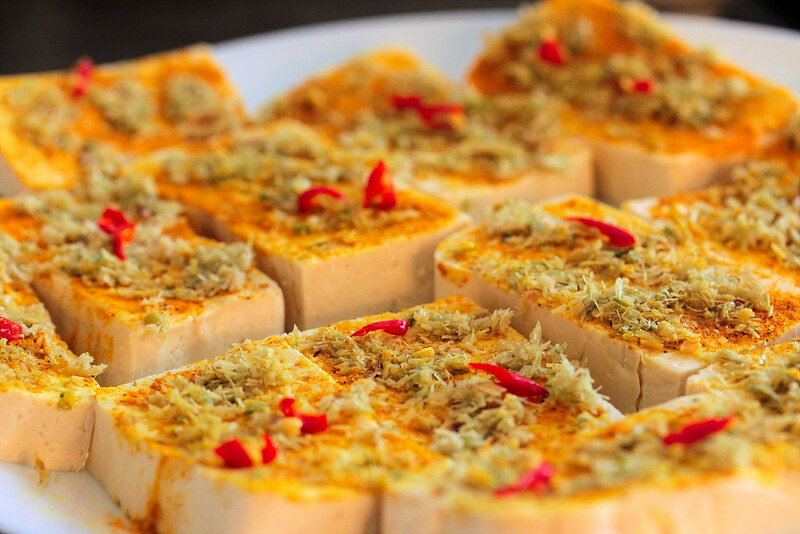 Coat each side of the tofu slabs with the lemongrass, pressing firmly to ensure that the lemongrass doesn’t fall off. Then top with some chili pepper. Pour enough oil into a 12” frying pan to reach a depth of about 1 cm, and heat over medium heat until hot. To test if oil is hot enough, insert the tip of a wooden chopstick into the oil and it should start bubbling around the chopstick. Place the slabs of tofu into the oil and allow to cook until the underside is golden. Carefully flip and continue cooking until the other side is also golden. Cook time for each side is about 3-4 minutes. Place the chopped herbs and lettuce at the bottom of a bowl. Then, top with the noodles, sliced cucumbers and tofu. 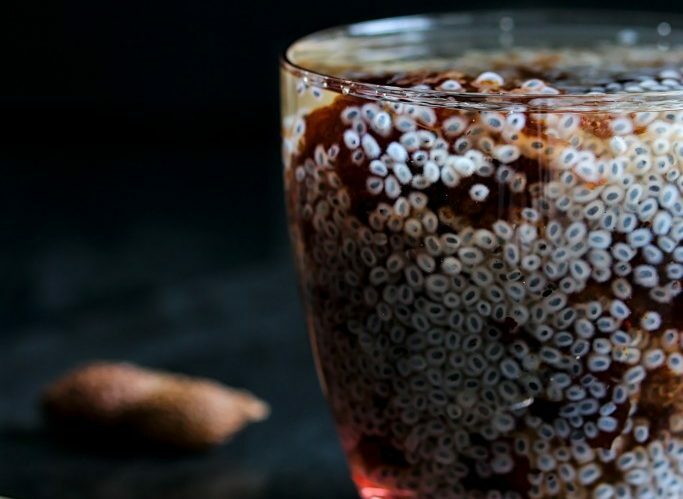 Drizzle 1-2 tablespoons of nuoc mam (or according to taste) over the noodles. Mix thoroughly and enjoy. 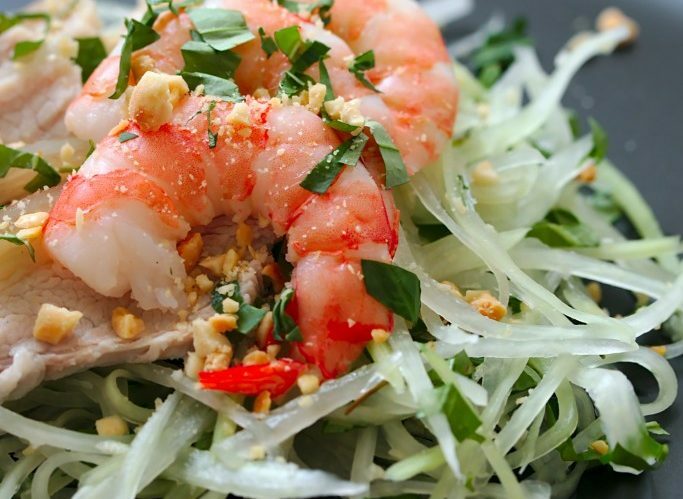 I was wondering where can we find these ingredients in Paris: bún (vermicelli rice noodles) & Vietnamese herbs? I do all of my grocery shopping in the 13th arrondissement at Tang Frère and Paris Store. There is also Thanh Binh Jeune in the 5th arrondissement as well as other asian markets in the Belleville neighborhood (Wing Seng). There are many different vermicelli rice noodle brands, but I highly recommend this one or this one. As for the herbs, asian basil, red perilla (leaf that is purple on one side and green on the other) and coriander should be enough. To make the fish sauce mix, I recommend this brand of fish sauce.